After battling through a myriad of injuries last year, Grace College’s volleyball team is excited to welcome in the 2017 campaign. The Lady Lancers field an experienced roster, led by six seniors who are primed to end their careers on a high note. Grace’s senior class of Kari Feddema, Tori Bontrager, Sara Miller, Naarah Foster, Sierra Smith and Savannah Hartenjoyed a national tournament during their freshman season. They have plans to return to nationals in 2017 and are armed with the big-game experience to back up those dreams. In the summer, Grace’s team took a mission trip to inner-city Philadelphia. That experience fused the players together in a unique way. Van Hofwegen noted the team’s chemistry has only grown from there during the preseason. Team chemistry is not always a certainty, especially with players battling for playing time. And several starting positions are up for grabs this fall. One of Grace’s strength will be its defense. NCCAA All-American Caylie Teel anchors Grace’s back row after amassing 621 digs (5.22 per set) in 2016. She partners with Miller, who has 1,201 career digs to her credit. The team’s offense is primarily returning, led by the strong arms of Kelsee Zuidema (335 kills), Smith (243), Feddema (195) and Marta Bleed (157). Smith and Bontrager, who both missed significant time last year with injuries, are back to full health. The two middle hitters each hit over .220 for the season, led by Smith’s team-high .252 percentage. Foster and Deborah Michalski add depth on the outside. Zuidema and Bleed are two of the hardest hitters on the team and bring experience to the outside attack, and Feddema is a tremendous vocal and emotional leader from the middle. The setter position will look new in 2017. Sophomore Alexa Hill played in every set except for six last year, but she was rarely setting. This year, however, she will be asked to fulfill the primary setting responsibilities. Freshman Gabbey Harrington adds another layer to the setting spot. The Cowan High School standout provides a fundamental technique to the position, creating a dynamic partnership with the athletic Hill. The freshman class is an enthusiastic group. Lexy Oppenhuis and Makayla Bell are athletic hitters, and Emily Sharpand Gina Novotny bring quickness to Grace’s back row. Away from the court, Grace has displayed a commitment to be invested in the classroom and the community. 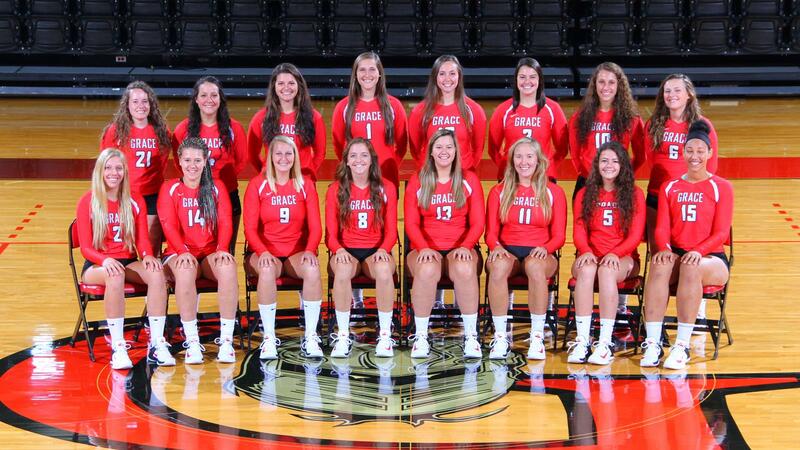 Grace boasted a 3.75 GPA last year, the highest team GPA on campus and 19th-best in the nation. The Lady Lancers were also one of the most active teams in the community last year, serving at a variety of organizations.